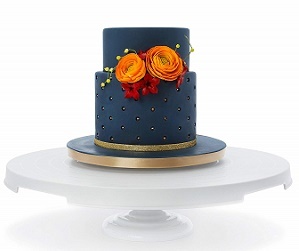 Above right, Cotton and Crumbs have designed an exquisite multi-tiered cake for Mother’s Day featuring pretty powder blue stripes, vintage lace and their signature vintage roses. 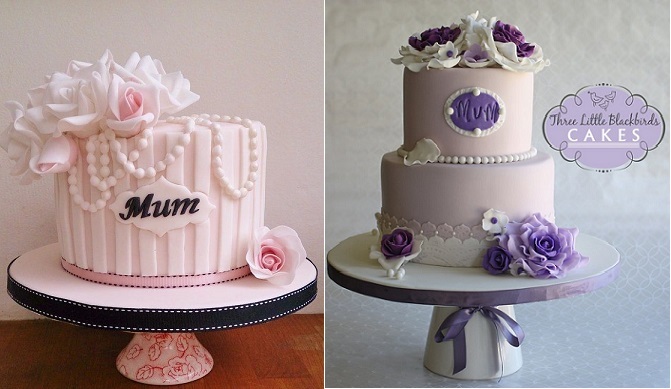 Vintage pearls and roses adorn the two exquisite Mother’s Day cakes below by the Brighton Cake Company, left and by The Three Little Blackbirds Bakery, right in shades of soft pink and lavender. 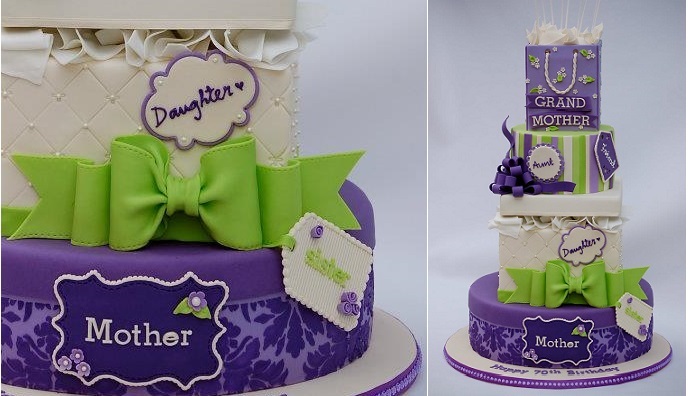 Lush sugar flowers in dusky pink and green adorn the beautiful Mother’s Day cake design below by Jo Takes The Cake/Lovely Little Cakes Ltd, but it’s the floral hand painted board that makes this cake design truly exquisite. 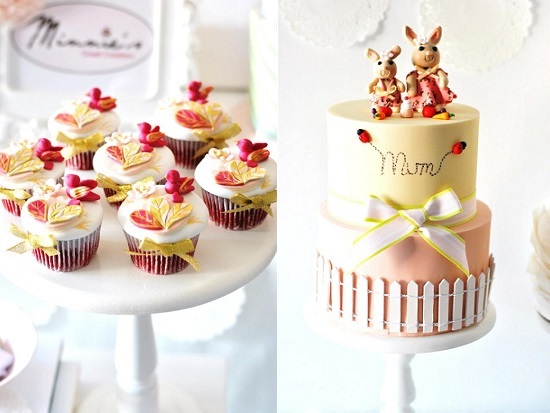 Mother’s Day cupcakes also make wonderful treat for Mums on their special day, with beautifully decorated chocolate cupcakes, below right (via Family Holiday.net). 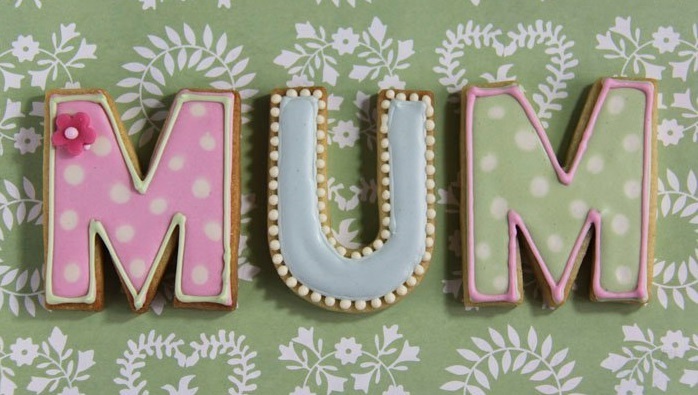 Luxury, decorated iced biscuits are a fabulous addition to any party and add an extra special touch to a Mother’s Day afternoon tea spread. 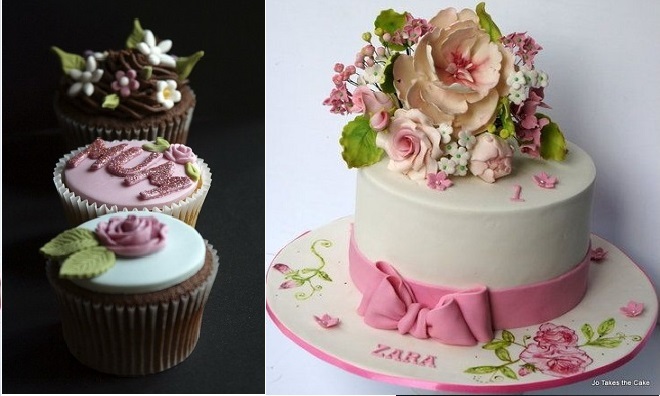 The beautiful cookies below are from cookie decorating expert, Juliet Stallwood Cakes and Biscuits. 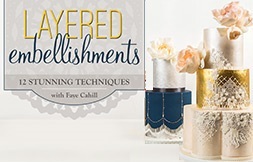 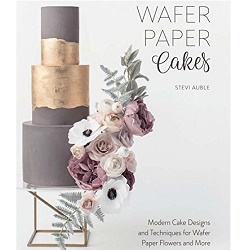 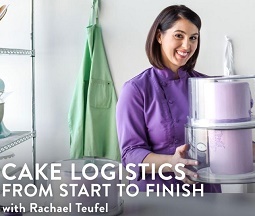 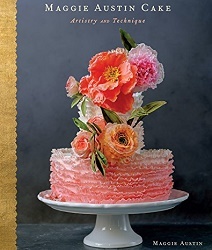 You’ll find more on Juliet’s decorating techniques in her book: The Icing on the Cake. 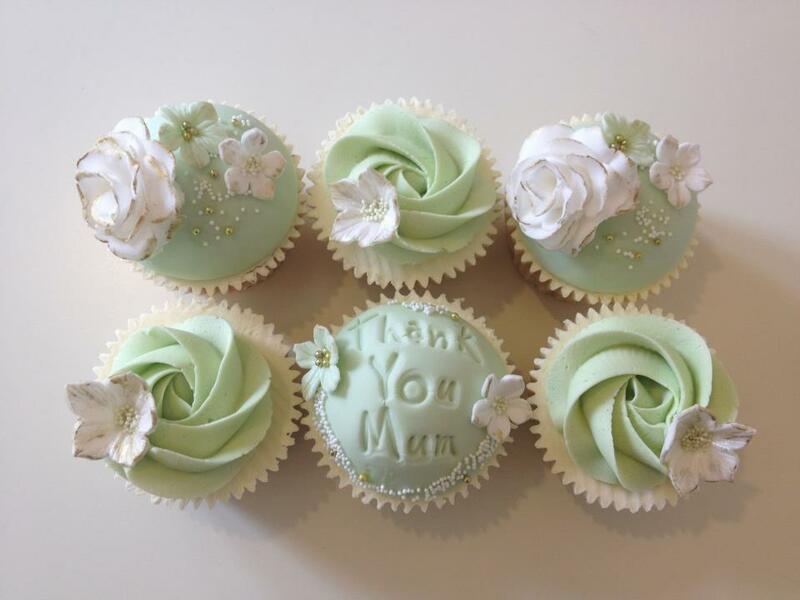 Cheryl’s Cake Boutique have designed the very pretty set of mint cupcake designs specially for Mother’s Day, which would make a lovely boxed presentation gift on the day. 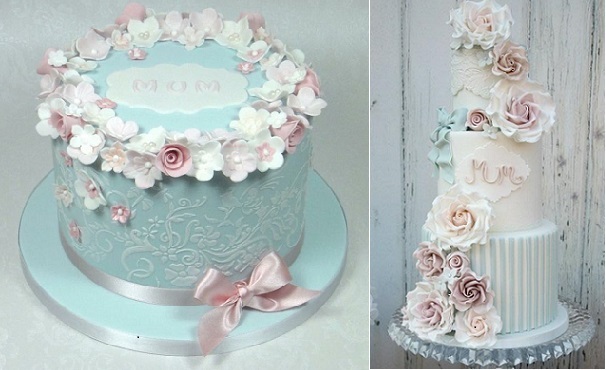 A textured buttercream cake makes a beautiful Mother’s Day cake, with the fabulous peach buttercream rose cake (below right) by The Little Cupcakery, Northern Ireland. 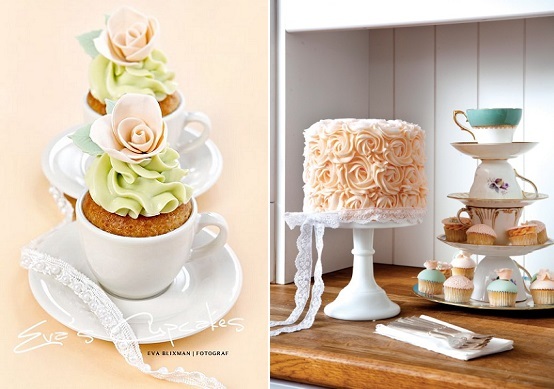 Below left, we have a lovely serving idea for cupcakes – in teacups – in a pretty spring colour palette of mint and peach by Eva’s Cupcakes (image by Eva Blixman Photography). 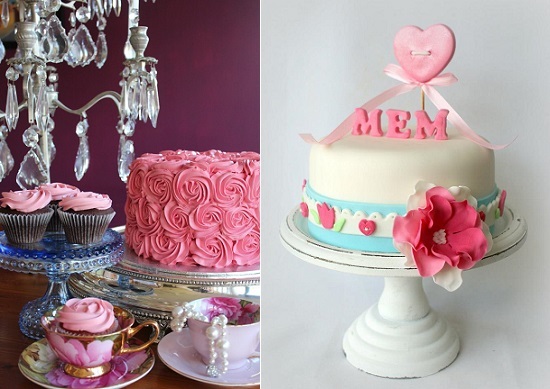 Scrum Diddly, have designed an exquisite Cath Kidson-inspired cake below left which would make a fabulous Mother’s Day cake. 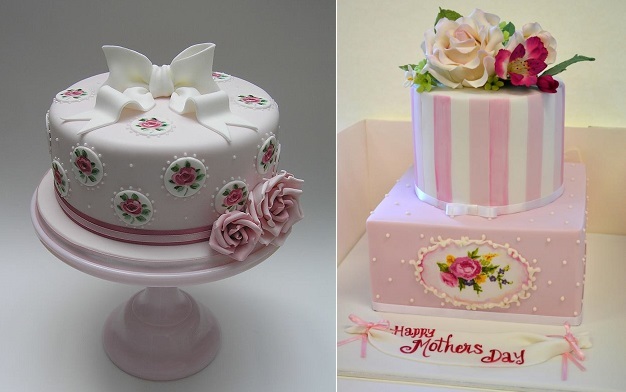 Below left, Sweet Ruby Cakes, Australia have also featured a retro-style theme in their pretty floral Mother’s Day cake below. 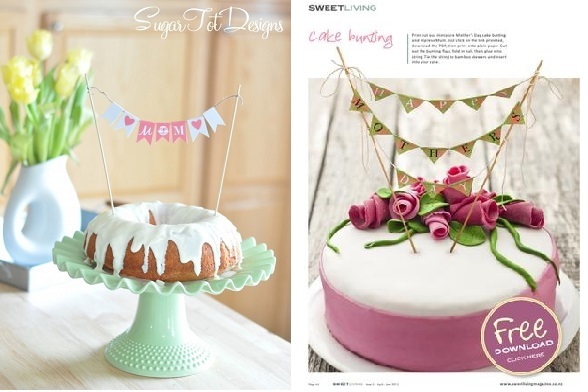 Vintage style bunting makes a terrific addition to any party cake and you’ll find the template for the Mother’s Day cake topper below left, right here: mother’s day free printable cake bunting from Sugar Tot Designs. 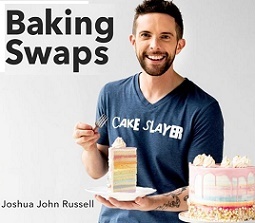 (Image below right via Sweet Living Magazine). 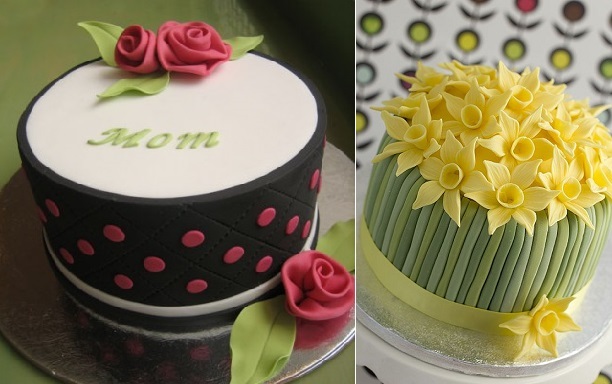 Two beautiful brightly-coloured mother’s day cake ideas below by The Betty Bakery, left and by Juliet Stallwood Cakes and Biscuits, right. 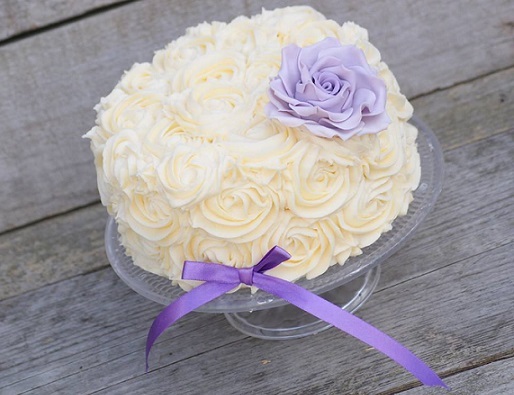 Lavender is such a lady-like colour and a simple lavender sugar rose and ribbon adds a beautiful touch to the textured buttercream cake below by Cakes by Jantine, NL. 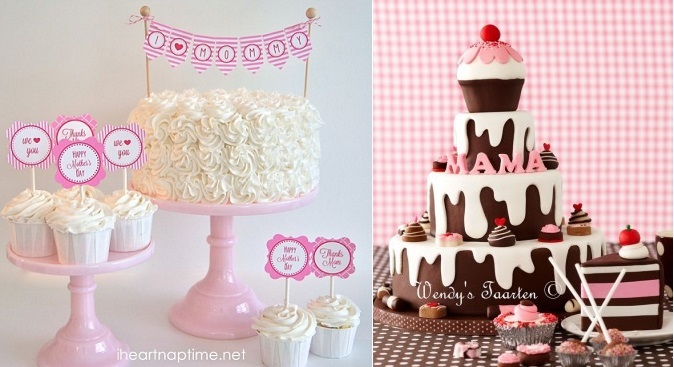 Below left, we have a pretty pink and white spread for a Mother’s Day party. 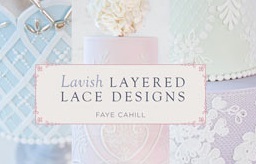 You’ll find the bunting and cupcake pick templates here: free printable mother’s day bunting cake topper. 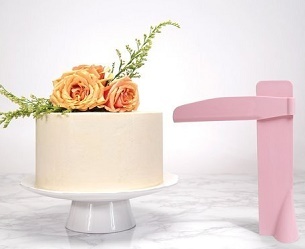 Vintage blue with a whimsical style pink heart cake topper makes another beautiful Mother’s Day cake design by Cakes by Jantine NL (below right) and to the left, a glamorous afternoon tea spread by Chloe Kerr Cakes. 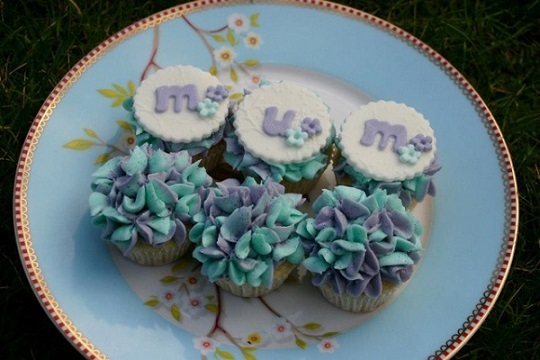 Below, we have very pretty blue hydrangea cupcakes for Mother’s Day by The Little Cupcakery, Northern Ireland. 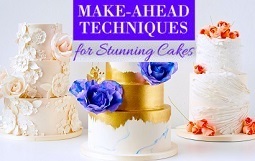 You’ll find a tutorial here on how to pipe buttercream hydrangeas by Rosie Cake-Diva. 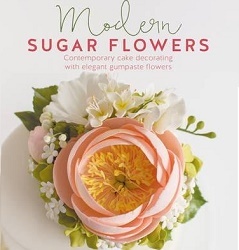 (Plus, you’ll find more on piping buttercream flowers in our feature on Cupcake Bouquets). 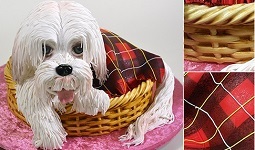 If your Mum is a gardening fan, then the quaint white picket fence cake below with Mummy and daughter bunny rabbits is a charming cake design for Mother’s Day by Minnie’s Sweet Creations. 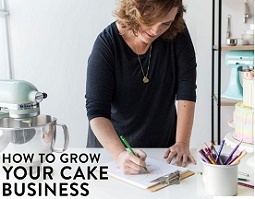 For Cake Geek updates, just add Cake Geek Magazine to your Facebook “likes” and we’ll let you know just as soon as a new feature is published! 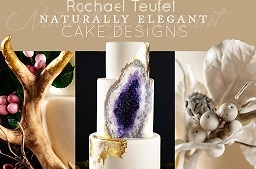 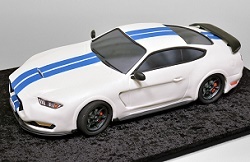 You’ll find us here at: Cake Geek Magazine Facebook Page.